Moleskine Action's functionality seems mostly unchanged from the iOS version. It's a full-featured to-do manager that helps you organize your schedule, generate reminders, and log activities. Each item in your schedule is called an action card. They include titles, reminders, and notes. The UI for setting reminders is also quite neat. You can also attach cards to custom lists. For example, you can have lists for work, shopping, errands, and so on. You can clear cards by swiping to the left and reschedule by swiping to the right. Your completed tasks remain in the Logbook accessible with a swipe from the left or with the button at the bottom of the screen. 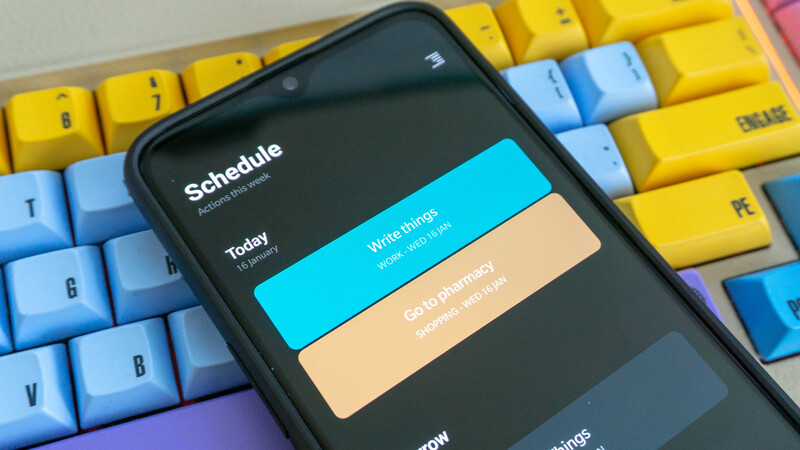 Cards flip into view as you scroll up and down in the main Schedule view—it's a neat animation. It makes the app feel a bit like a physical notebook without being unnecessarily skeuomorphic. The interface is OLED black with splashes of colors, dictated by the aforementioned lists attached to your action cards. From my limited time with the app, it also seems very snappy. It opens in a flash, which is good as there are no widgets. You'll have to open it every time you want to check your to-dos. That's a bit of a bummer. I also wish Actions had an option for multi-item checklists. Moleskine Actions is only live in select markets, one of which is the US. The developer plans to roll it out to all regions following the soft launch. Although, I don't know if a US-first launch counts as "soft." At any rate, those in supported countries can download the app to try free for one week. After that, you'll need a subscription to keep using Moleskine Actions. It's $2 per month or $12 per year. This app has a slick design and solid functionality, but the subscription will be a tough sell when there are already so many capable to-do managers on Android.